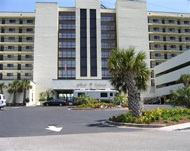 The Shell Island Resort is located at Wrightsville Beach. Rooms feature ocean-front views, private balconies, 1.5 bathrooms, cable TV, kitchenettes and sleep up to six people. The resort is secluded at the northern-most end of Wrightsville beach, but is still close to popular dining and shopping destinations. The resort offers corporate and wedding facilities for up to 300 guests.